Frances and Malcolm are not even nice to each other, although they are unusually attached. And let’s not forget about Small Frank, the cat who follows them all the way to Paris, and who Frances believes to house the spirit of her dead husband. It’s hard to talk about this book without using words like ridiculous, ludicrous, absurd, preposterous, and strange. But it’s also smart, entertaining and funny. So many kinds of funny; funny strange, funny funny, stupid funny, crazy funny, that-could-never-happen funny, darkly funny, and snort-your-drink-out-your-nose funny. You are likely not surprised to hear that I enjoyed (most of) it immensely. But I’m not sure that every reader will appreciate deWitt’s sense of humour. The parts that were not as ‘enjoyable’ were learning about the childhoods of Frances and Malcolm. But this serves to help us understand them better. Is it possible that the reader might even start feeling a little bit sorry for them? Could we go so far as to like them? That might be a stretch for this reader. But read it and see for yourself. Frances had prepared herself to face off against a roomful of impeccably dressed French women of high social standing. It was to be a night of implied insults and needling insinuations and she could hardly wait to get started. 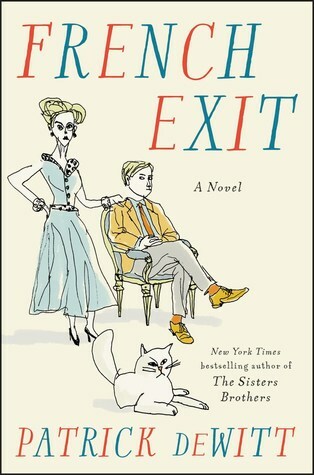 Have a listen to Tania and Kirt talk about French Exit on their podcast at Write Reads. Thanks for the link, Naomi. I, for one, will never forget Small Frank! And I did end up feeling sorry for both Malcolm and Frances, both of whose childhoods deserved attention from social services. I am reading in right now, I am about halfway through and I like it, but already I do feel sorry for both of them. I certainly do not envy the way they live! And I’m very thankful not to know anyone even remotely like them! I think I remember that you liked The Sister’s Brothers more than I did. It’s hard for me to know whether I would like this one better. I really enjoyed de Witt’s The Sisters Brothers when I read it a few years ago. This one sounds very good too, albeit in a somewhat different vein! They are very different stories, but same unique sense of humour, I think. Now I’m curious to read the book that came between the two! It doesn’t surprise me, though – I can see how the humour in this could rub someone the wrong way. Or even if it catches you in the wrong mood. Ottessa Moshfegh’s books, I think, are the same way. I like hers, too, but can see why others might not. I loved this book! Mainly because DeWitt balanced humor with pathos so perfectly. It reminded me of Eleanor Oliphant and any book with unlikable characters who make me laugh and resonant. Yes – unlikable characters who make us laugh – it’s a great combination! And probably very hard to do. I still would like to read Eleanor Oliphant… I think I’d like it. Still on my list to finish!!! Not sure this will happen by Monday! You never know… It’s a quick one! I’m still on hold for this at my library -I had it once and didn’t have time to read it so I had to turn it in. I suspect I’ll enjoy it, but who knows? I’m certainly willing to give it a shot. I didn’t read his first book. I certainly enjoyed it. And it’s a quick read! I’m really enjoying everyone’s reviews of this – it sounds bonkers! I’ll definitely be looking to read this, I enjoyed deWitt’s humour in The Sisters Brothers. I think his his humour in this one is even more bonkers! I love that you quoted his line from the Giller Gala: it’s just perfect! And even though not everybody will connect with this style/these characters, it’s actually really been surprising for me to see how many readers have done so already! These are not easy characters with whom to spend time, so it’s amazing that he has seduced so many of us into doing so, when all we have to do to shut the cover and let the book fall to the floor (where Small Frank could pee on it). *snort* And Small Frank *would* pee on it! I kept poking Anansi to send this to me and they kept ‘forgetting’, so the chances of me reading it are quite slim now (sigh). It does sound right up my alley though, I love reading about snobby rich people who don’t care, it’s deliciously fun! You should really get it from the library or something – I think you’d like it – and it’s pretty short!